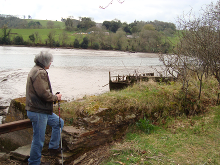 Longmarsh Press publisher and author Bob Mann has spent a lifetime walking around Totnes and the surrounding Dart valley, studying and absorbing its topography, history, wildlife, folklore and creative associations. Join him in a Guided Walk through the old town or its surrounding landscapes, and learn about some of the stories contained within them. Walks can be tailored to the particular interests of the participants. Since 1992, Bob has led hundreds of people through the ancient streets and byways of the town, telling them about its ghosts and legends, and describing the strange experiences that individuals have had in various locations. Most of these stories were unknown until the publication of his book The Ghosts of Totnes by Obelisk in 1993. The walk happens every Tuesday from Easter or the beginning of April (whichever comes first) to the end of October, and takes about an hour and a half. There is no need to book in advance; just be outside the Totnes Information Centre (by the entrance to Morrisons’ car park) at 8pm. If it is raining, bring an umbrella! Adults £5, children under 18 £3. Ghost Walks at any other time, for parties of 6 or more, £50. Explore the old town, its byways and quiet places, and hear some of the words that have been written about it over the centuries. Discover the many diverse authors who have passed through and left their impressions, or who have settled here and featured the place in their work. This is a walk that can very easily be geared to the particular interests of the walkers, and can be at any time required. For parties of six or more, £50. 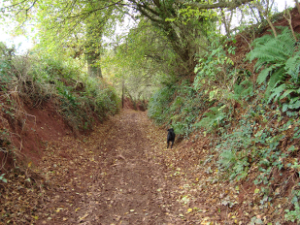 Green lanes and footpaths lead out of Totnes in every direction into the rich South Devon countryside of fields, woods and riverside wetlands. Parties of six or more people are invited to join Bob on a number of walks of anything from two to five miles, taking as long as required. They can include riverside strolls to Ashprington or Dartington, rambles to Harberton or explorations of the interconnecting lanes and paths around the town. The longest is along footpaths and lanes to Berry Pomeroy Castle and back (not including entrance to the English Heritage-run castle ruins). The walks cost between £5 to £10 per person, according to distance and duration, but each walk can be planned to suit the group concerned. Controlled dogs welcome. Contact Bob on 01803 847930 or through this site to discuss your ideal walk.